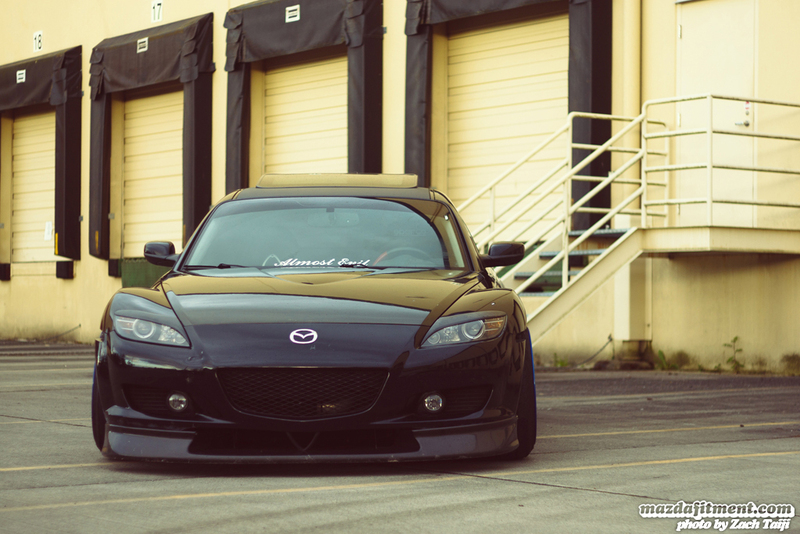 Words and Photos by Zach Taiji If you attended StanceWars this year, one of the cars you may have noticed is Sean King’s RX-8. It previously created internet hype with the last setup, MB Weapons. And now the car is back on some fresh wheels and a couple new mods. First thing you’ll notice is how low the car is; almost undriveably low. 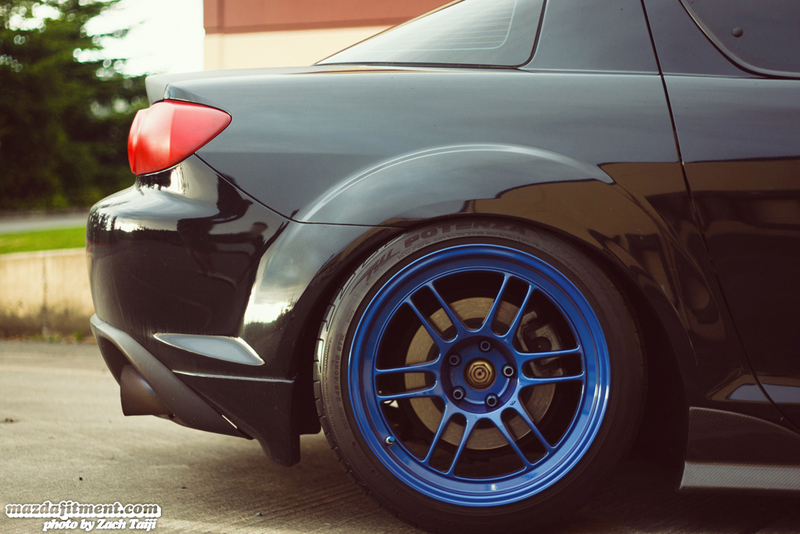 This RX-8 is sitting on Megan Street Coilovers, and to accompany them are new wheels. 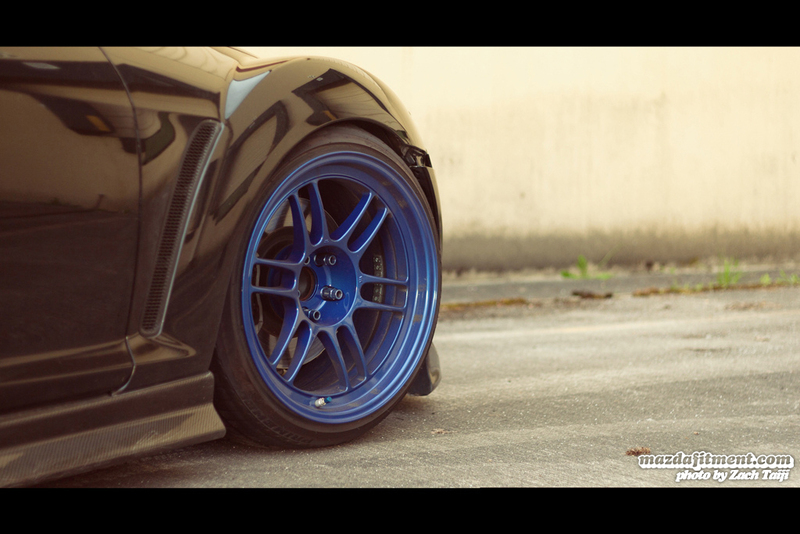 They’re Enkei RPF1′s in a Royal Blue. The fitment is super aggressive, 18×10.5 +15 all around. Thankfully the RX-8 has wide arches to fit such a big wheel. To finish out the rest of the exterior, the roof and trunk have been wrapped in dry carbon, and the front end is completed by a VIS CF hood and evo-R CF lip. Yes, Sean loves Carbon Fiber. Hell, there are even Seibon CF Sideskirts to round everything out. The best part about the car is that these modifications are subtle enough not to scream out at you, but when you take the time to gaze at it, you’ll really notice all the little things. 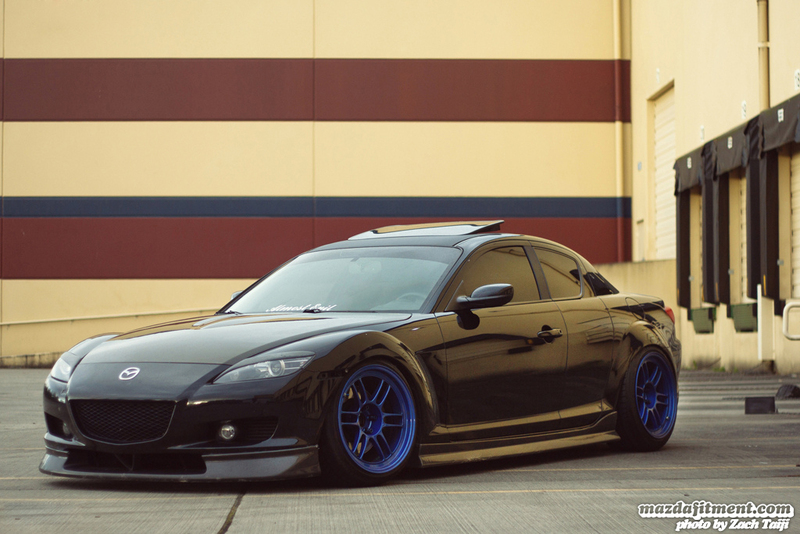 Basic Engine mods are an MS (MazdaSpeed) Intake and Exotic Speed Exhaust; if you’re an RX-8 owner you know that power mods aren’t cheap for these cars and offer very little gains. Sean has something planned for the future though; think “big power”. sooo this looks sick ! i like the size of the tires ……looks badass with the thicker tires any info on what the rubber is ? I am extremely inspired with your writing skills and also with the format on your weblog.